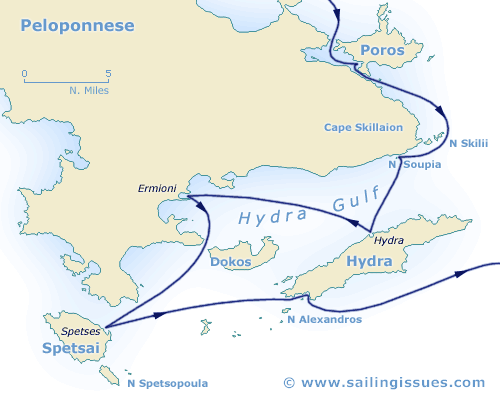 This time we decided to sail from Athens on a one-way bareboat charter to Melos (last two weeks of May). This is part two of the logbook that describes this adventure. Click on the thumbnails to see a larger 800x600 photo in a new window. 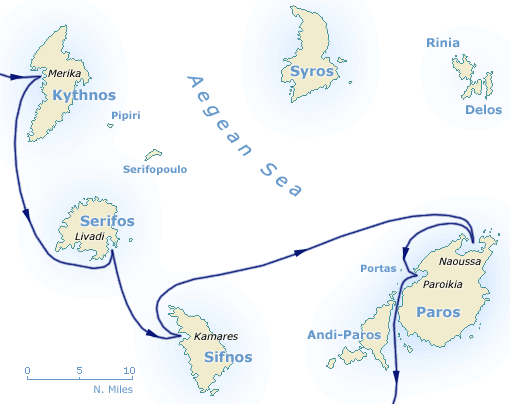 The plan this day was to go to Nisos Soupia, the lizard or frog shaped islet just off the Peloponnese (see map below). So, in the early morning we navigated the narrow channel between the main land and Poros island leaving the Bourtzi island to the west. Now, further away from Athens, there wasn't another yacht in sight. Behind frog island we choose the narrower eastern bay and anchored in 4 m. depth and spent the rest of the afternoon diving, swimming and exploring the beautiful countryside. Yet, again the stern anchor could not be set. And after trying every trick in the book we decided it unsafe to spend the night there and sailed to Hydra port where we found a nice spot on the quay. The approach is fantastic; the white houses are majestically spread on the slopes over the harbour, however the opulent mega-yachts will keep their engines running and deteriorate the ambiance with their diesel fumes and tedious passengers. We stayed in Hydra and located some excellent showers and internet services in the south west corner of the harbour at the Yaghting cafe. It is owned by Antonio, who also owns the Sunset bar where you can have a swim (it is outside and just west of the harbour). Naturally, we took the hot and exhausting walk to the monastery, and despite the absence of its only monk, the climb was definitely worth the effort. After a great deal of tacking exercises we arrived at the south east side of the Ermioni peninsula. This little village lacks charm, though provisions are plentiful and there is a cosy internet cafe overlooking the actual harbour at the north side of the peninsula. Our visit ended with a jolly water fight and one casualty: Frank slipping on the muddy slipway - nomen est omen. To clean both our slippery crewmember as well as his pants we decided to drag him along at 2 miles an hour. Early in the afternoon we left for Ay Nikolaos at the western tip of Hydra island. Again, the wind turned against us and we made friends with all the little islands and reefs that extend from Hydra. Especially, with Nisos Alexandros, which we dubbed “Single Tree Island” (see the middle photo). Finally, we arrived at this beautiful inlet and tugged in real close to the pebbled beach. In the evening, Laura, Martijn and I rowed the dinghy out of the bay and dispersed the ashes of my late father, who was a great seaman himself. After this sad moment, we dined copiously on fresh fish bought from a local fisherman, who had dropped anchor in AY Nikolaos as well. We got up well before six in the morning, and saw the sun gaining on the rugged dark side of Hydra. Today we set out for Merika (Mericha) on Kithnos Island (see maps above and below), however all wind was gone and would stay away the whole day. But instead of being bored (50 nm is a long way to motor), we were feasted several times on groups of dartling dolphins. Fantastic ! Early in the afternoon we arrived at Sandbar bay (Ormos Kolona) just north of Mericha, where lots of Greek day-trippers spent their free Saturday afloat. Indeed, during the weekends the Athenians double the normal amount of tourists in the Argo-Saronic as well as the Northern Cyclades. After a good swim we went to Mericha and had diner at the waterfront.